So when Graco got in touch and wanted me to review their new Graco Evo pushchair as part of Generation Graco, I jumped at the chance. I decided to give it a test drive on a family trip to Drusillas Park near Eastbourne. As it lies flat, the Evo is suitable from birth. Perfect for my 10 week old baby! It has a sleek design, and is very sturdy. It doesn’t feel as flimsy as some of the buggies on the market. With a toddler too, we often walk into town to go to toddler classes, the park or to meet friends. I need to have one hand free to hold Fred’s hand whilst still being able to steer the buggy with ease. 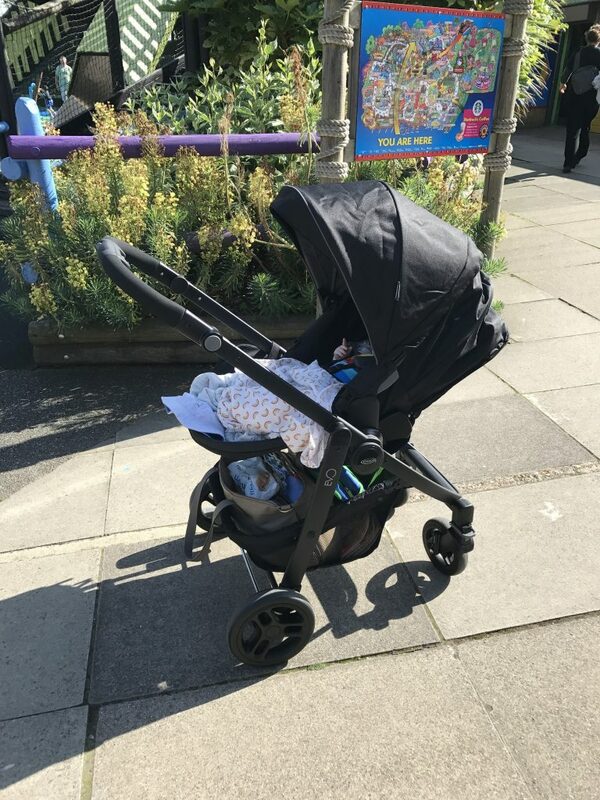 I’m pleased to report that it’s so easy to control the buggy with one hand, whilst gripping my toddler’s hand with the other. Phew! 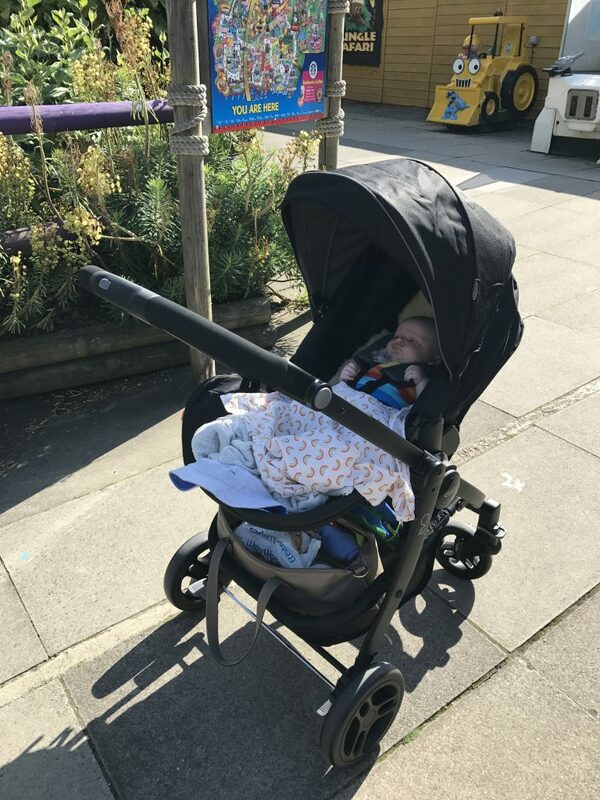 One of the things I like most about this pram is how easy it is to take on and off public transport. As I don’t drive, I do need to be able to hop on and off buses and trains easily. It’s relatively narrow, so can fit into the buggy park on a bus (next to another buggy too). It’s not just for my youngest either; Fred has been in the seat too (I always have a sling in the basket at the bottom, just in case I need to swap Tommy out and Freddie in!). It’s really simple to swap the seat round from parent facing to forward facing; just a quick click, and it’s off. Fred wants to see the world now… he’s fed up of looking at my face! Haha. Folding it is very easy too – again, just a flick of the switch and it’s folded down nice and compact, ready to pop in the boot (if you drive) or make more space in your hallway (like we do). The SnugRide i-Size carseat is perfect for the newest addition to our family. It is compliant to the new i-Size regulation, and has been designed to provide protection to babies rear-facing from birth up to 18 months. The newborn insert made sure that Tommy was comfy and cosy on our trip to Drusillas. The base was super easy to fit into the car (my Dads car, that is!) and the car seat itself even more so. It was so easy in fact, my Dad was completely thrown about where the seat belt should go. 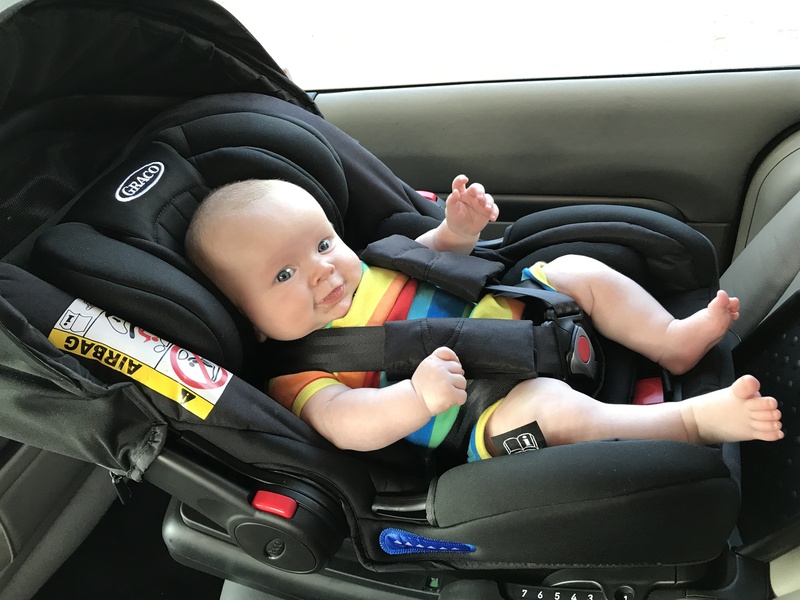 I had to point out to him that it didn’t need a seat belt to be secure (our previous car seat didn’t have a base and needed to be threaded through a seat belt) and that it really was that easy to fit. Taking the seat out is just as easy (and if you forget how to do it, there are handy instructions on the side of the unit). It has a 7-position adjustable base which means as baby gets older, he’ll still be comfy in the rear facing position. Perfect for when the grandparents take him out for that day! He is just too sweet – love his rainbow vest, too! 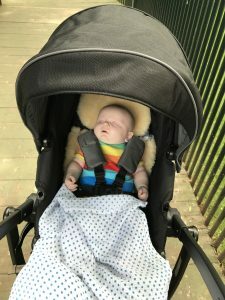 I am loving the adjustable base for the Snugride, it’s so nice to be able to adjust the recline as my 13 month old was starting to get frustrated being so reclined in his infant car seat – since we’ve been using the Snugride he’s been a lot happier.